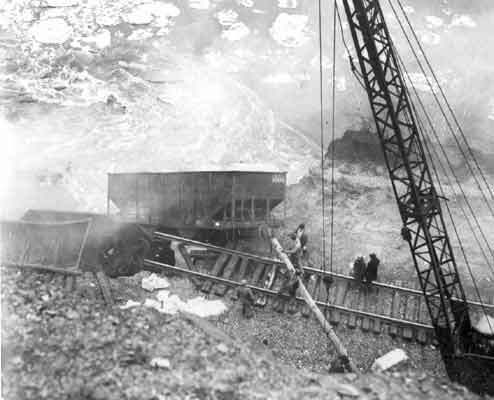 Tuesday, January 22nd, 2019 is the 60th anniversary of the Knox Mine Disaster. On January 22, 1959 miners were at work in the River Slope of the Knox Mine Coal Company when the Susquehanna River broke through, allowing the raging icy river to pour into the mine. 12 miners did not make it out, becoming forever entombed in the mine. Abandoned gondola car that did not make it into the Knox Mine River Slope. This car sits downstream of the disaster site and can be visited during low water events. In a desperate attempt to plug the hole in the river, rescuers were pushing gondola train cars into the river to no avail. After 3 days, a coffer dam was built to try to finally close the hole in the river and prevent water from further flooding the mines. The mine was later pumped out, but no bodies were ever recovered. Company greed, negligence, and drilling past the safety stop line lead to a disaster that claimed the lives of 12 men. In addition to loss of life, the disaster site is so fractured that a 2500 foot section leaches mine drainage directly into the Susquehanna River. The Knox Mine Disaster Documentary premieres tomorrow night. Click here for tickets and information! If you’ve ever driven through Northeastern Pennsylvania, there’s a chance you may have seen some orange streams flowing near or through towns. 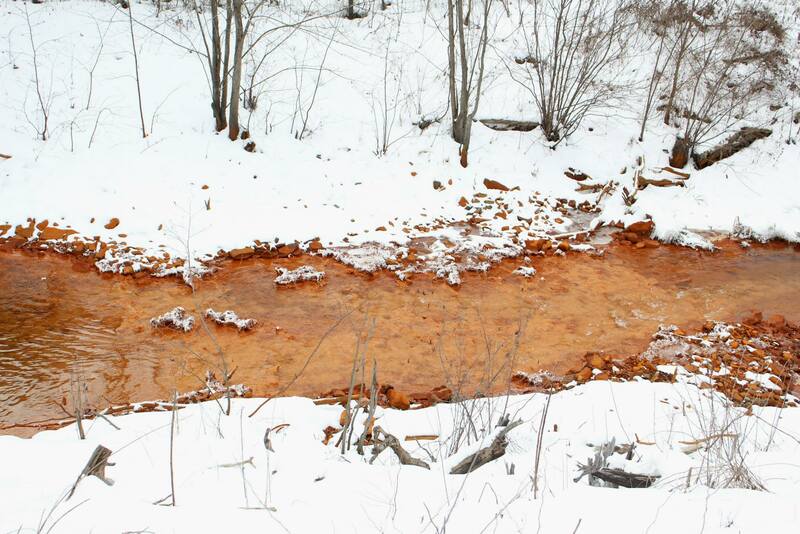 The orange water is caused by abandoned mine drainage, or AMD, flowing from abandoned mine openings and drilled boreholes to relieve pressure from the underground minepools. During the era of Anthracite deep mining in NEPA, coal companies had to pump water from the underground mine workings in order to continue mining into deeper and deeper coal veins, a costly operation that left many companies unwilling and unable to continue mining. After all of the coal companies went bankrupt, along with historic events such as the Knox Mine Disaster in 1959 and the Historic Agnes Flood of 1972, deep mining was ended and the water began to spill out of any available opening leaving streets, basements, and streams filled with polluted mine water. Knox Mine Disaster 1959: Coal cars were driven into the gaping hole to try and close the mine opening in the Susquehanna River. This event ended flooded most deep mines in the Wyoming Valley. Because SMCRA, the Surface Mining Control and Reclamation Act, did not go into effect until 1977, none of the coal companies were held liable for the severe water quality issues they caused. As a result, the federal government had to drill boreholes to relieve the mine water and prevent it from destroying private property and infrastructure. Now instead of flooding property, the abandoned mine drainage pours into streams across Pennsylvania, destroying over 5,000 miles of stream throughout the state. AMD flows through a stream during the winter. Because mine water stays at a constant 55 degrees Fahrenheit, the stream doesn’t freeze in the winter. AMD forms when water reacts with Pyrite, or Fool’s Gold, deep in the underground abandoned mine workings. As the Pyrite is exposed to water and oxygen, the sulfides within the rock react and break down to form sulfuric acid and iron oxide. Other metals and minerals within the rock can also become exposed and pollute the water, with many discharges in PA and other states containing heavy metals such as iron and aluminum, with some discharges containing harmful amounts of arsenic and lead. In Pennsylvania, AMD occurs in the Anthracite Region in the Northeast and the Bituminous Region in Western PA. In the Northern Anthracite fields, most AMD discharges have heavy concentrations of iron with relatively neutral pH’s around 6.5, the same pH as normal rainfall. In the Middle & Southern Fields and the Bituminous Region, discharges tend to be more acidic (4 pH) with heavy concentrations of aluminum. While this pollution problem will take a lot of time and work to remediate, dedicated groups are working to fix this problem by installing treatment systems, restoring streams, and educating the public about this issue.